Put the yum into your meals with more than 85 mouthwatering vegan recipes! Veggie Blog Award from VegNews magazine. with Seitan, Kale, and Carrots • and much more . . .
how to go gourmet the vegan way. When I started my blog, veganyumyum.com, in late 2006, I never dreamed it would turn into a book. In fact, I never really even imagined anyone would read the blog. I'd post a recipe with a photo, and I was absolutely dumbfounded one day when someone commented on the site to say they had made a recipe and liked it. Once people find out that my husband and I are vegan, they proceed to ask us a lot of questions (I'm sure you've fielded these questions as well, if you're vegan). Some of the questions involve ethics, factory farming practices, and hypothetical 'But would you eat eggs if . . .' situations, but one question persists: What on earth do you eat? While I rattle off the list, what most people usually picture is unappetizing steamed vegetables, a pile of beans with a sprig of parsley on top, and a block of wobbly tofu. They either haven't had any experience with vegan food or the experience they had wasn't a good one. When I first went vegan three years ago, it was a bit of a mystery to me, too. I was totally amazed that you didn't need eggs and dairy for baking, and that the resulting treat tasted just as good. Or that with a little imagination and a few swaps, you could make decadent things like doughnuts, cupcakes, and a macaroni and cheese that rivaled my mom's and weren't just pathetic vegan stand-ins for the 'real' versions. It was then that I became sort of obsessed with creating vegan food, both savory and sweet—recipes that would be enjoyed by even the staunchest carnivores. Would I want each and every person to try a vegan doughnut and declare him or herself a vegan convert? Sure. A much more attainable goal, however, is much less dramatic. I want to provide vegans with an armory of fantastic recipes they can serve to their friends and family with pride. If you've just gone vegan and find yourself in need of kitchen skills—fast—I want you to have a book full of step-by-step recipes that will make you feel like a pro in no time. And I'd simply like people not to cringe when I tell them the cupcake I'm offering them happens to be vegan. You don't have to be a vegan to eat like a vegan. You don't have to be a vegan to put together a vegan meal. You don't have to be vegan to like vegan food! I really, truly hope this book convinces people of these things. And, of course, if you are convinced, I hope going vegan is something that you seriously consider. Confession time: I'm not a chef, and I've never been to cooking school. All of the photographs in this book were taken by me. The food pictured here was made in my tiny kitchen and eaten by my husband and me immediately after photographing it (even if sometimes it was slightly colder by the time we finally got to eat it). I point these things out because I think it's important for you to know you can make food that looks and tastes just as good. It's all real food you can make in your kitchen, starting today. You don't need to be a chef or a food stylist to sit down to meals like these. My point is that great food is just that—great! A lot of great food is vegan, and you can make it for yourself starting here. Bon appétit! If you're thinking about going vegan, congrats! I know it seems like a big change, and it is. But it's not as hard as you think. You'll probably be curious to try the vegan versions of your old favorites. Vegan cheese, vegan milks, vegan meats. It can get expensive, and I guarantee you it'll be at least somewhat disappointing. The best advice I can give you is to focus on fresh, whole foods at first. But that doesn't mean you shouldn't give some of the specialty products a shot; you never know what you like until you try. But stay open-minded and take the time to learn how to make foods that you really love, not poor imitations of foods you no longer eat. That's the secret to being vegan and loving it. That being said, there are a few specialty products that I can recommend that might make your transition easier. Most margarines have whey in them. Earth Balance is 100% vegan, and in my experience, the very best butter replacement there is. Everyone has their favorite soy milk. It really is worth it to try different brands to see what your favorite is. Personally, I find Silk to have the best flavor and texture, and it won't curdle in your coffee like other nondairy milks can. The refrigerated version is different than the nonrefrigerated version. Personally, I like the refrigerated one. Tofutti makes a killer cream cheese and sour cream. Other brands just don't stack up in my opinion. There are all sorts of cheeses out there. Many are pretty gross. My three favorite cheeses are Teese, Sheese, and Dr. Cow. Teese cheese is made by the Chicago Soydairy. It melts fabulously, so it's great for anything you'd normally put mozzarella on. Sheese cheese has a wonderful cheesy flavor (I love the smoked cheddar! ), but it doesn't melt, so it's best on crackers or in sandwiches. Dr. Cow makes wonderful, hand-crafted nut cheeses that don't have any scary ingredients in them, perfect for a gourmet treat. I had no idea what nutritional yeast was before I went vegan. You'll find that most vegans use it and love it. Not only is it a nutritional supplement (offering a full assortment of B vitamins, including a vegan source of B12), but it also lends what most people describe as a 'cheesy' flavor to your food. I disliked it at first, but now I use it quite frequently. Give it a shot on some salted popcorn as an experiment! There are all sorts of wonderful and delicious foods out there (and in this book!) that will show you what being vegan is all about. You can be compassionate to the planet without giving up great food. It's a myth that vegan food is boring, flavorless, and uninspired. No one has to choose between compassionate living and delicious meals. You can be the best cook your family and friends know, and not in spite of you being vegan—but because you are. 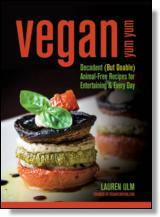 Lauren Ulm, "Lolo," is a vegan foodie and founder of veganyumyum.com who lives in Boston with her husband and two cats. She is not a chef, has never been to culinary school, and she's not a professional photographer (but she has fun pretending!) When she went vegan in 2002, the kitchen became her favorite room in the house, and still is today. She has appeared on The Martha Stewart Show and has been featured in Vegetarian Times.